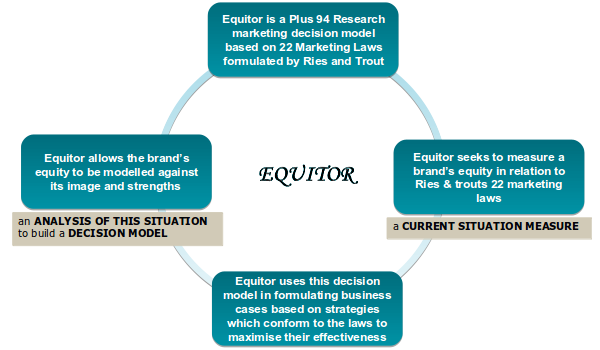 Equitor is a Plus 94 Research marketing decision model based on 22 Marketing Laws formulated by Ries and Trout. Equitor uses this decision model in formulating business cases based on strategies which conform to the laws to maximise their effectiveness. Law 1 – Is the brand that comes in first –The Law of Leadership. Law 2 – Is the brand that set a whole new way of looking at this product category – The Law of the Category. Law 3 – Is the brand that comes first to mind than to be first in marketplace – The Law of the Mind. Law 4 – Is the brand I perceive to be the best – The Law of Perception. Law 5 – Is clear and persistent in what it stands for – The Law of Focus. Law 6 – What it stands for is uniquely different from other brands – The Law of Exclusivity. 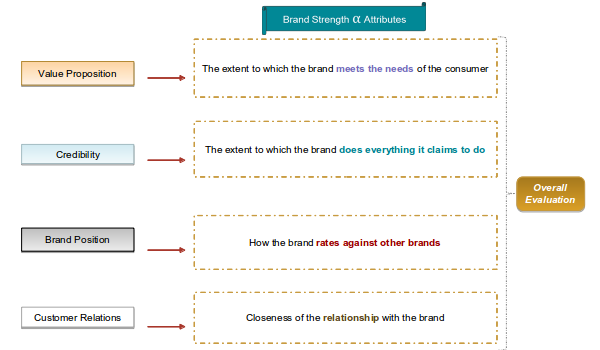 Law 7 – Although the brand is not number 1, it is a serious challenger –The Law of the Ladder. Law 8 – It is one of the two leading brands of this product category – The Law of Duality. Law 9 – It capitalises well on the weaknesses of its competitors – The Law of the Opposite. Law 10 – It competes well in all the key divisions/segments of this product category – The Law of Division. Law 11 – Its image has withstood the test of time – The Law of Perspective. Law 12 – Its line extensions, or other versions of the brand are successful – The Law of Line Extension. Law 13 – The brand is prepared to sacrifice something that is less important, in order to maximise something that is more important to me – The Law of Sacrifice. 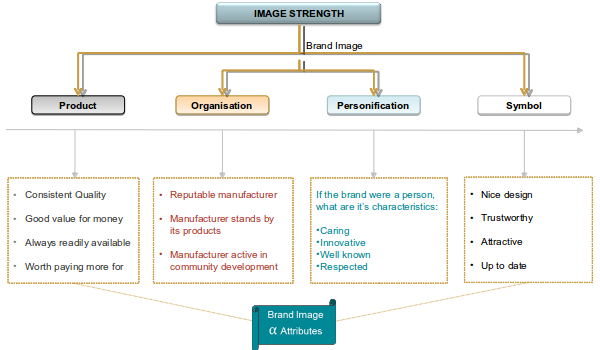 Law 14 – The brand has unique and attractive attributes – The Law of Attributes. Law 15 – It is an honest brand that does not claim to be perfect – The Law of Candor. Law 16 – The brand does not confuse the customer with too many messages – The Law of Singularity. Law 17 – Seems to be well prepared for the future uncertainties – The Law of Unpredictability. Law 18 – Its success has led to arrogance – The Law of Success. Law 19 – The brand is able to move on from past mistakes and failures – The Law of Failure. Law 20 – There is a lot of hype about the brand in the media – The Law of Hype. Law 21 – The brand has a tradition and trend of success – The Law of Acceleration. Law 22 – The brand has sufficient resources behind it to be successful – The Law of Resources. To develop Business Cases and Strategies for your brand which adheres to the laws of marketing to ensure robust market presence and ongoing success.